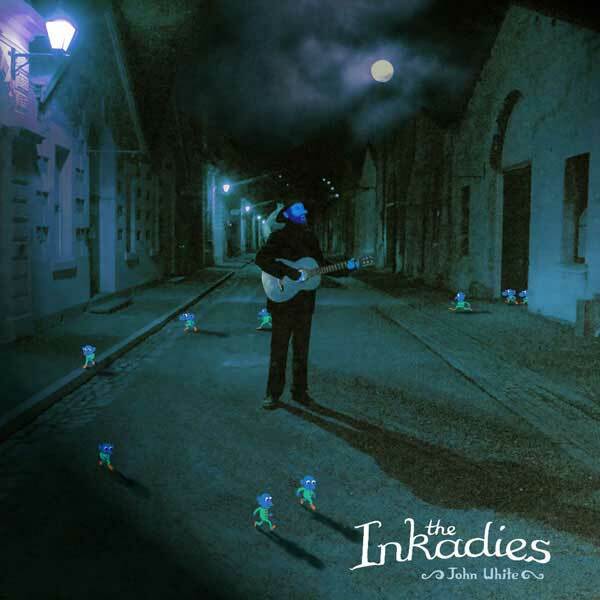 Dream-pop folk artist John White released his long overdue third solo album, “Inkadies” on Monkey Records. As a follow up to “Balloon Adventure”(2000) and “Mogwash”(2003), “The Inkadies” might be described as the third instalment of tales from a delicate otherland where little creatures called Inkadies come to save the day. The album was recorded in Madison, Wisconsin by friend and fellow singer/songwriter, Tom Hanson. Gathering guest musicians from Madison’s lush music scene, the album boasts chiming harmonies and dripping Synth accompaniments underneath John’s dreamily relaxed vocals and gently strummed acoustic guitar. John White is also the frontman for seminal Dunedin fuzz-pop band Mëstar and toured extensively with now defunct avante-popsters Cloudboy. Cloudboy’s Demarnia Lloyd once upon a time said of him that she’d “discovered a boy who sings like angel” – Dunedin’s best kept secret has to be John White. His tenure fronting fuzz-pop trio Mëstar established him as a well loved songwriter in knowing circles, while White’s previous two solo albums (2000’s “Balloon Adventure” and 2003’s “Mogwash”) were the stuff that dreams are made of. Recorded in Madison, Wisconsin by musician Tom Hanson, “The Inkadies” (White’s first release in too many years) is an unofficial ending to a trilogy begun all those years ago. To listen to a John White album is to succumb to a dream world, both in terms of his fantastical themes and his ethereal textures, which come in a range of guises, including relaxed singing (as well as delightful harmonies), gently finger-picked guitar or silky synthesisers. This album could slip past as easily unnoticed as White’s recent New Zealand tour, it whispers rather than shouts, is mostly dreamy rather than grounded. Formerly out front of Dunedin’s Mestar, White recorded these airy but sometimes fuzzy, acoustic-framed songs in Wisconsin three years ago and apparently this one follows two previous albums. Over the 11 short Anglofolk-styled songs (none more than three minutes, most less than two) White’s soft and high voice doesn’t explore much range beyond weightlessness, so it is down to synth drones (by producer Tom Hanson) to provide some musical breadth. But this is never less than interesting, sometimes stands at the midpoint between early Donovan and early Bonnie Prince Billy, and over repeat plays the slightly disconcerting tunings and sonic settings (the distant “thunder” on The Fields, the vaguely creepy Juvendee Hill) or gentleness (The Boy That I Saw on That Day, Little Blue Bird which sounds an incomplete idea) make themselves known.